Conservative media resorted to their tired playbook of spinning and obfuscating right-wing figures’ clearly racist remarks after Rep. Ron DeSantis (R-FL), the Republican Party nominee for governor in Florida, said that his Democratic opponent, Andrew Gillum, would “monkey” up the state. While a spokesperson for DeSantis said it was a term the congressman “frequently” uses, there is no evidence for that claim. Right-wing media figures frequently run defense for high-profile conservatives caught making racist comments. The comment is insanely stupid given the way our politics run. But I'm highly dubious that DeSantis was "dog whistling" here. Attacks on a candidate are fair game (right or wrong). When you accuse him/her of using a “dog whistle,” though, you’re attacking the voters. 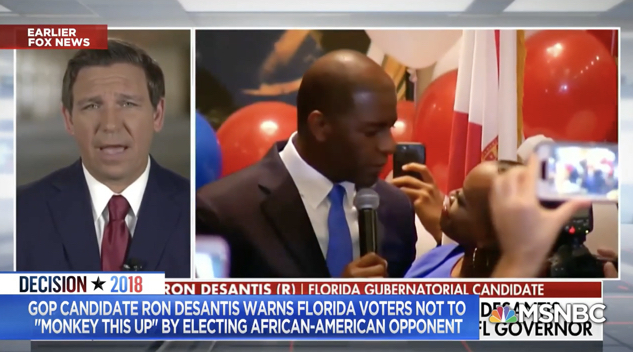 Given how quickly the media/left pounce (see what I did there) whenever they think they can accuse any Republican of racism, it was not smart of DeSantis to say what he said. But I really doubt he meant it as the media proclaims.